Lenin’s mausoleum in Moscow’s Red Square offers up one of Moscow’s most macabre attractions and perhaps the most famous “modern mummy” in the world. Frozen in time, Vladimir Ilych Lenin’s embalmed body lays within a red granite and black labratorite step-pyramid. Here visitors may gaze on it in the dark, cool of the tomb. 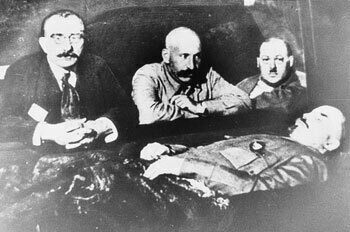 When Vladimir Ilych Lenin, the leader of the Bolshevik Revolution, died on January 21, 1924, he did not believe he was going to an afterlife. He assumed that death was the ultimate end for him. How wrong he was. In his will, Vladimir Ilych Lenin requested he be laid to rest in the ground. Instead, he was embalmed and interred in a temporary wooden cube designed by architect Alexei Shchusev. His body was on display before his funeral, and - while the government planned to bury him, according to them - the Russian people wouldn’t have it. The Russian government allegedly received over 10,000 telegrams from the grieving public asking for the body of great leader to be preserved in some way for the generations to come. In response to the public outcry, the permanent mausoleum was commissioned in 1929 to preserve Lenin’s remains for a longer period of time. The current mausoleum was unveiled in 1930, again designed by Shchusev. Lenin’s body remained here until it was evacuated to Tymen, Siberia (along with his embalmers, who worked to keep it “fresh”), since Moscow was under the threat of Nazi invasion. In March of 1945, a Soviet operation codenamed “Object No. 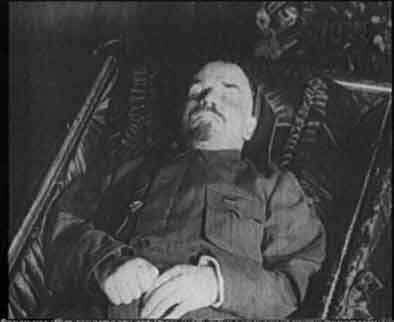 1” moved Lenin’s body back from Siberia to the Moscow mausoleum. 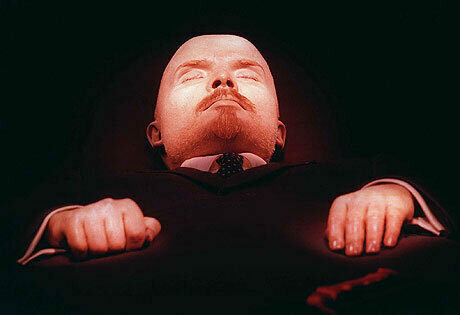 To continue the preservation of Lenin’s body, a group of special embalmers (originally Ilya Zbarsky and his son Boris Zbarsky) are dedicated to Lenin’s corpse. Unfortunately Lenin’s 85-year-old body still has a distinctive “wax-fruit” look to it, despite being warmly lighted to make him appear more lifelike. The sarcophagus is kept at a constant temperature of 16° C (61° F) and humidity of 80 - 90 percent. Weekly, a mild bleach is used to fight discoloring fungus and mold on Lenin’s skin, and every eighteen months the corpse undergoes a chemical bath of glycerol and potassium for thirty days while the mausoleum is closed. During this time, Lenin’s clothes are washed and carefully ironed. And every three years, Lenin receives a new suit. Sadly, due to the recent economic crisis, the charity that funds Lenin’s upkeep has fallen on hard times and can’t afford to buy Lenin a new silk suit. But then, Lenin would probably cherish the knowledge of capitalism’s global meltdown more then a new suit, anyway. Lenin can be viewed for five minutes at a time in small groups under the watchful eye of guards in every corner of the room. 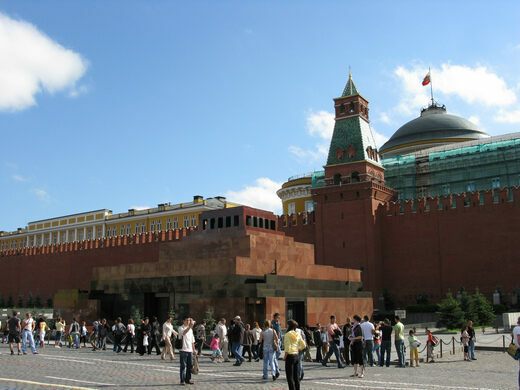 Lenin's Mausoleum is situated on the Red Square, next to the walls of Kremlin. Museum rules state no talking, smoking, or taking photos inside.